The Columbia River fall chinook run is booming as measured at Bonneville Dam, but the fish returning to the Snake River continue to face a thermal blockage at Lower Granite Dam. Last Monday, more than 63,800 adult fall chinook stormed past Bonneville Dam to set a new daily record. The previous record was set on Saturday when 48,000 were counted passing the dam. On Tuesday, the tally was more than 56,000 followed by a robust 42,500 on Wednesday and more than 22,000 each on Friday, Saturday and Sunday. So far this year, a record 677,222 fall chinook have been counted at Bonneville. On Tuesday the technical advisory committee, a collection of regional salmon managers, upgraded the run forecast from the preseason mark of 434,000 and say it could top 1 million. Most of those fish will head to the Hanford Reach on the Columbia River but a growing number are bound for the Snake River. Information gleaned from pit tags implanted in hatchery fall chinook indicates 58,000 of the fish counted at Bonneville, are headed for the Snake River and that number could grow to 75,000. 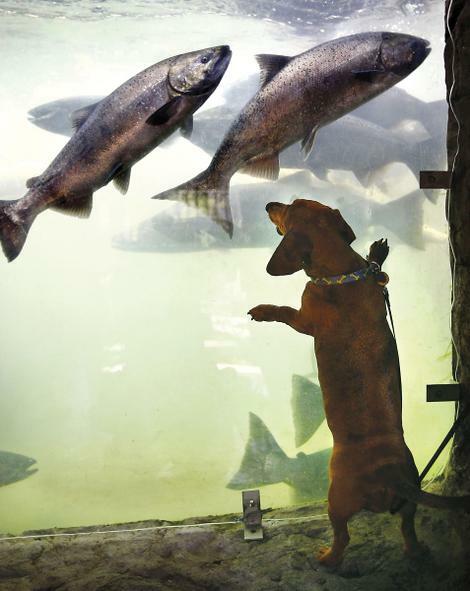 With a typical conversion rate of 65 percent, as many as 49,000 hatchery fall chinook could return above Lower Granite this fall plus another 30,000 wild fish. The preseason forecast called for 24,000 hatchery fish and 16,000 wild fish. As of Sunday, only about 11,000 of those fish have crossed Granite. Passage of fall chinook, sockeye salmon and steelhead has been delayed at the dam because of high temperatures in the fish ladder there. There are more than 10,000 fall chinook stalled between Little Goose and Lower Granite dams. Fisheries officials have been attempting to prompt fish movement by pumping cold water into the ladder. The strategy has met with only limited success and has been confounded by other issues there. Biologists Becky Johnson of the Nez Perce Tribe and Russ Kiefer of the Idaho Department of Fish and Game said the hydroelectric turbine closest to the fish ladder is down for repairs. Typically, that turbine is used this time of year so the current it generates also helps to attract fish near the entrance of the fish ladder. To make matters worse, the roof of the powerhouse is being repaired and that has led to changing flow regimes. The number of fall chinook passing the dam took a promising jump last Monday when 2,360 where counted using the fish ladder there. But on Tuesday, only 132 adult fall chinook passed the dam, followed by more than 1,000 each on Wednesday, Saturday and Sunday. "It feels like you are kind of watching a train wreck coming, where 50,000 fish are heading for the Snake but the water is warm and we can't cool it," Johnson said. "It's very frustrating." "It's encouraging they are coming, it's a little discouraging they are momentarily delayed below Granite," Kiefer said. The tribe and others normally trap some of the fall chinook in the Granite fish ladder for hatchery spawning but haven't been able to start because the trap and pumps can't be operated at the same time. Kiefer said the fish, fisheries officials and fishermen may have to wait for Mother Nature to correct the problem. "It is looking likely that we are going to have to wait for the weather to change conditions down there to allow adults better passage," he said, adding the short-term forecast calls for a string of days with the temperature in the 90s. Fall chinook fishing season is open on the Snake River in Idaho and Washington and on short sections of the Clearwater and Salmon rivers in Idaho.